Wash your panes with an innovative cleaning method that has met the requirements of over 94% of our clients in City of London! Q: What makes the water-fed pole better than other established washingapproaches? A: Unlike the original ladder & squeegee method, the water-fed pole allows the experts to reach windows from the comfort of the ground. The expandable pole is 22 metres high and can easily reach even smudges on the fourth storey of your building. Q: What other cleaning possibilities are are part of window cleaning City of London? A: Besides providing meticulous exterior window cleaning, the licensed technicians can also climb and clean any commercial multistorey building – a service called rope access window cleaning. Finally, the cleaning experts can also take care of dust found on the interior surface of your panes, and will bring ladders and squeegees to access distant corners. A: Our water has been filtered from all naturally found limescale deposits. As a result, it will efficiently eliminate all blemishes on its path and will evaporate under the sun without leaving residue marks of its own. Q: Does your service cover treatment of industrial buildings? A: Yes, the City of London window cleaners will arrive with the latest cleaning equipment to rinse business buildings both small-scale and elevated. The pros can also carry out optional cleaning tasks, for instance patio washing and gutter cleaning. A: Certainly. The team's water-fed rod is linked to a special filtered water tank inside the cleaning van. In case the liquid has been used up, the cleaners will kindly ask you to offer them with any inside or exterior water source. A: Yes, all our services are comprehensively insured for your comfort. However, our washing technique is among the safest that you can find on the market and we'll make sure to wash your casements without leaving a single graze mark! With the intuitive water-fed pole cleaning tool, the professionals can help you outshine your competition at modest rates. And you can press down our window cleaning City of London rates even further by merging two or more of our washing services together! To check the exact numbers behind our price offers, make sure to stop by our convenient price table below. Depending on your needs, our window cleaning City of London can provide you with three alternatives. If you choose exterior cleaning, the experts will utilize a special water-fed pole. 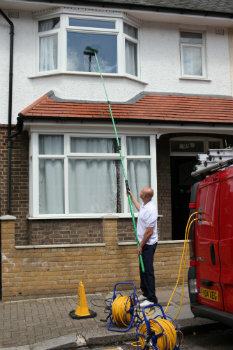 This cleaning tool can stretch up to 22 metres in length, which is equivalent to the height of a four-storey property. The City of London window cleaners will use purified water under high pressure that will rinse away all stains in almost an instant. If you run a lofty property instead, then go for our rope access window cleaning. There, a team of approved climbers will methodically polish your windows until they witness the mirror image of the setting sun. For your comfort, we check the cleaning equipment on a frequent basis and can offer COSHH reports at your request. For internal washing, the specialists will bring ladders and sponges to ensure that even the highest places will benefit from proper treatment. Do any of your friends need help with blasting away persistent window streaks? Scroll down to learn which areas the City of London window cleaners can cover. Alternatively, get a free instant quote or order affordable window cleaning services City of London EC online, through our web site.